Dimensions: 100"W x 30"L, center is 15"L. Measured from top stitch of rod pocket. Color: Red Spice Free fabric sample. These 100 percent linen Farley Duchess window valances by Ellis Curtains are available in a spice red Jacobean floral design at The Curtain Shop. The valance is 100 inches wide and 30 inches long to accommodate a standard single window. The center length is 15 inches. This fully lined linen valance has a 2-in. header and 3-inch rod pocket. We recommend the use of a 2.5" continental rod or 1 3/8-inch decorative rod for hanging. 3" rod pocket, 2" header, fully lined. Use 2.5" continental rod or 1 3/8" decorative rod for hanging. The Duchess Valance window topper is a two piece treatment split in the center, and fits a standard single window. 100% Cotton, dry cleaning is recommended. Create a serene new focal point for your room with this beautifully tailored Duchess window valance by Ellis Curtains available in Odessa blue at The Curtain Shop. Designed to fit a standard single window, the split center allows insertion of a Duchess valance insert for wider windows. This fully lined 3-in. rod pocket two-piece valance has a 2-inch header. The width is 100 inches, and the length is 30 inches. The fabric is 100 percent premium cotton. 3" rod pocket, no header, fully lined. Straps are sewn in to rod pocket for easy hanging. 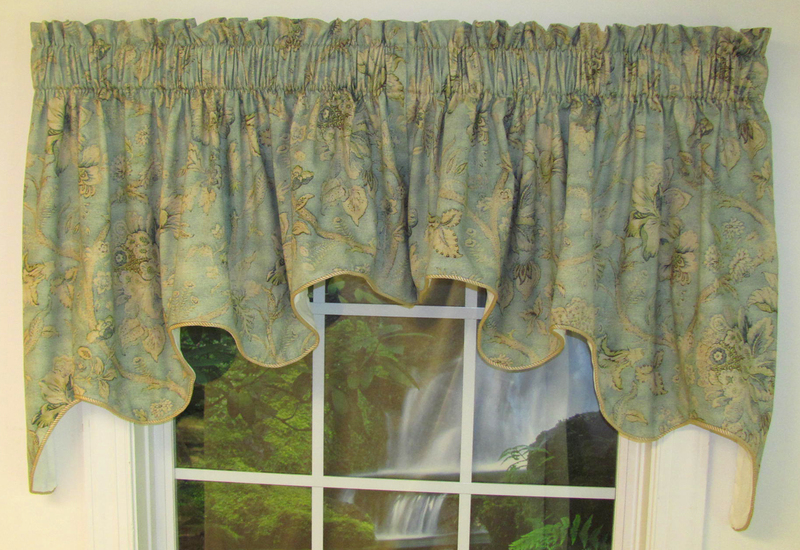 This tie-up valance comes in the elegant Michaelina print. The 100 percent cotton fabric features rich yellow and green tones with red accents in a lovely floral pattern. The valance measures 50 inches wide by 30 inches long and comes with a 3-inch rod pocket and no header. It is fully lined and features straps sewn into the rod pocket for easy hanging. This window topper is made in the U.S. by Ellis Curtains. Dry cleaning is recommended. 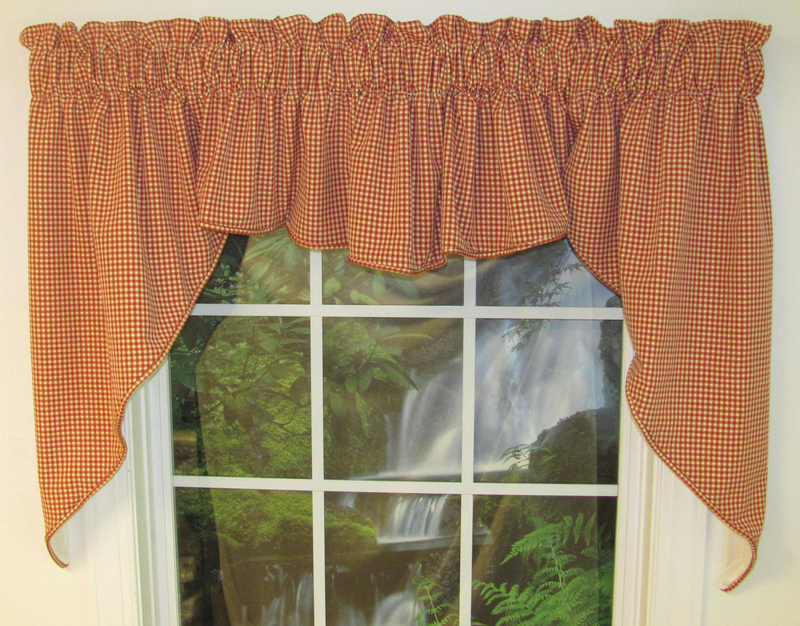 Add timeless charm to any room in your home with our attractive Country Check Valance. 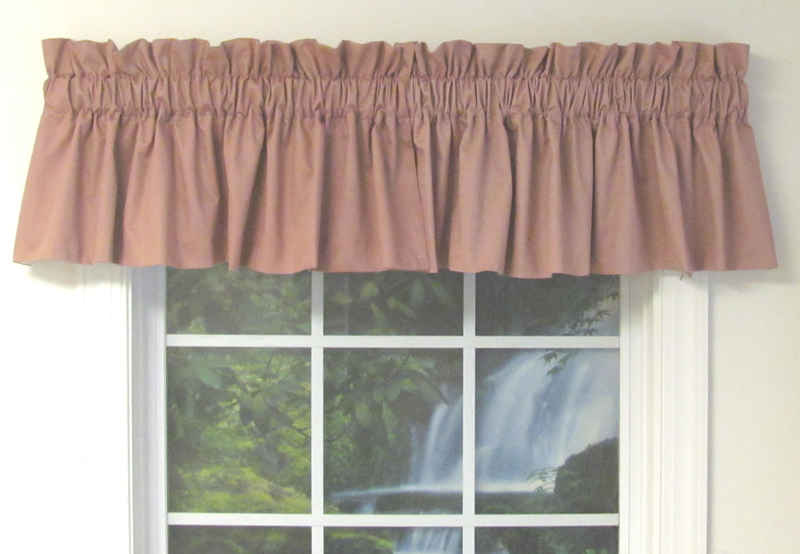 Arch Valance has 1.5" rod pocket, 1.5" header Dimensions: 56"W x 18"L Color: Mahogany 100% Cotton (including ball trim) Machine wash gentle cycle, cold water, tumble dry low heat, touch up with low iron as needed. Dimensions: 50"W x 30"L. Free fabric sample. This tie-up valance comes in the Farley print, which has a striking, medium-scale Jacobean design with a light blue background. The elegant design features sewn-in, matching straps as well as a 3-inch rod pocket. A 2 ½-inch continental rod should be used for hanging. 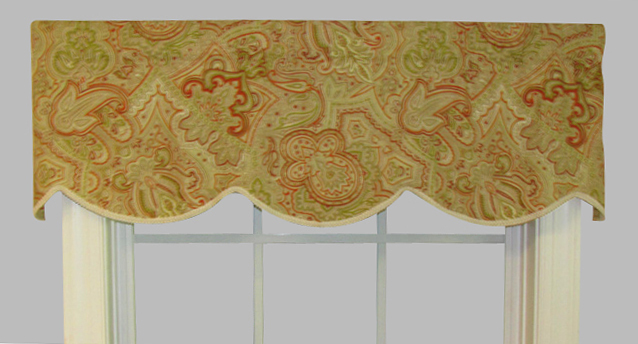 This lovely valance is made from 100 percent linen, so it should be dry cleaned only when cleaning is required. Measurements are 50 inches wide by 30 inches long. Attractive and functional with adjustable straps that are sewn into rod pocket for easy installation. Straps adjust up to 63" long. Machine wash cold, gentle cycle. Tumble dry low heat. Imported from India by Ricardo Trading. Dimensions: 84"W x 63"L, center is 12" long. Dimensions: 84"W x 38"L center is 12" long. 1 1/2" rod pocket. Use standard 1" rod or decorative rod for hanging. This three-piece set measures 84 inches wide with 63-inch sides and a 12-inch center. Imported from India by Ricardo Trading, the Sachet swags come with a 1 ½-inch rod pocket for use with a standard one-inch rod. 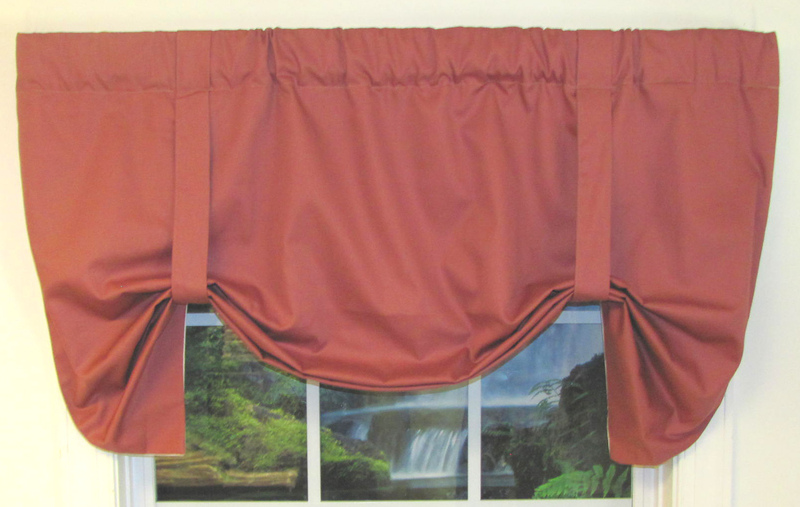 Each set includes one pair of swags and one insert valance, with additional inserts available for wider windows. These 100 percent cotton swags can be machine-washed cold on the gentle cycle and tumble dried on low, with iron touchups as needed. 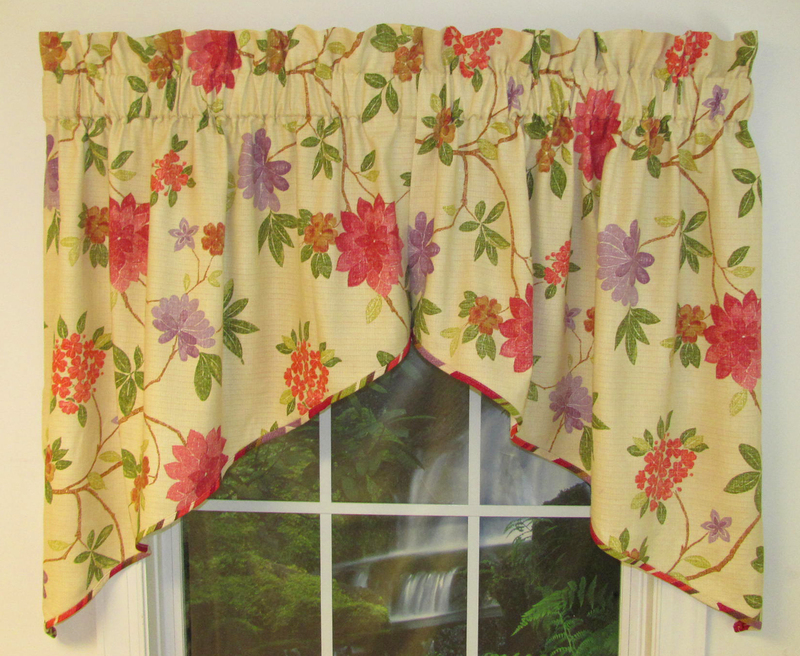 Floral Valance is smartly accented with coordinating plaid straps. Matching Tier Curtains are Plaid. Straps are sewn in at rod pocket for easy installation. 1 1/2" rod pocket, no header. TIER CURTAINS ARE NOT INCLUDED. Machine wash cold water on gentle cycle, tumble dry low heat, warm iron as needed. Claiborne is a lovely and versatile textured poly/cotton blend fabric. 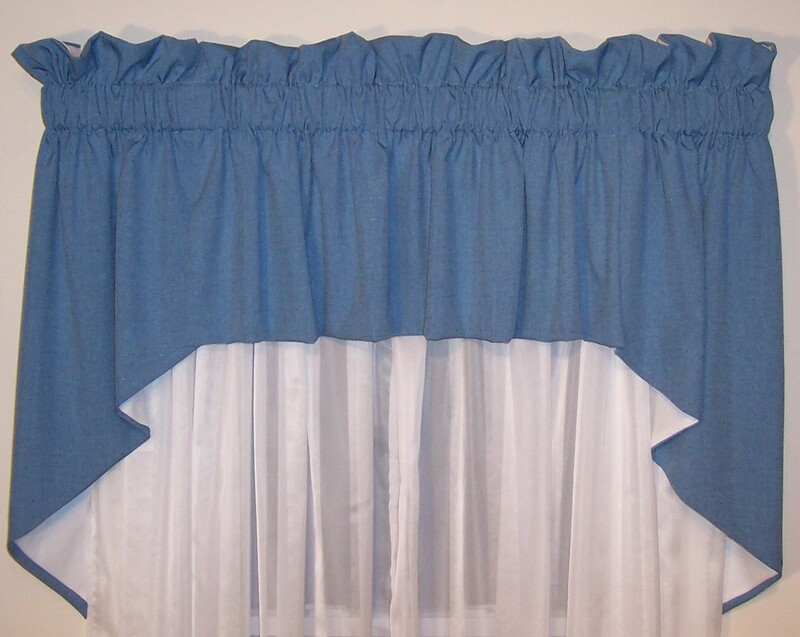 The M Shaped Valance features a 3" rod pocket, no header, and is fully lined in off white lining material. 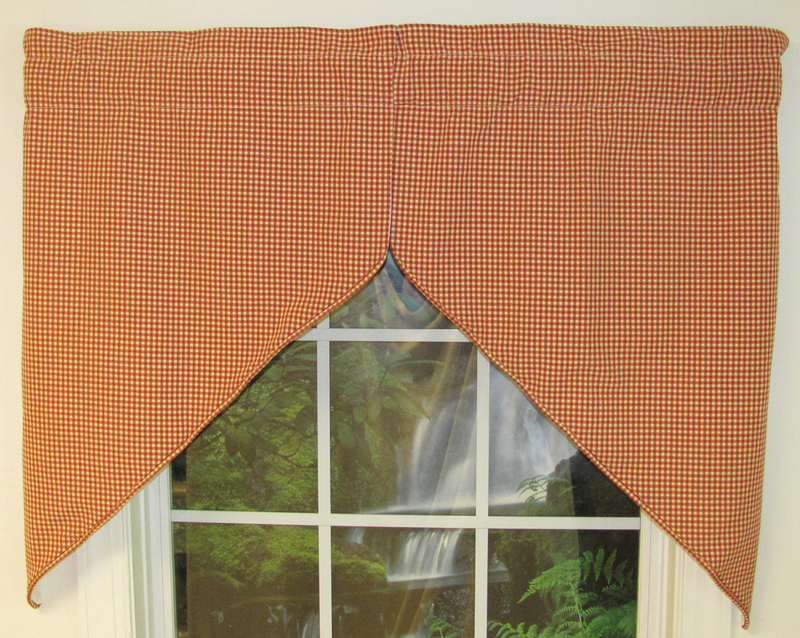 The M Shaped Valance has a scalloped bottom edge shaped like an M.
Made of 70% Polyester, 30% Cotton. Dry cleaning is recommended to extend its life and beauty. 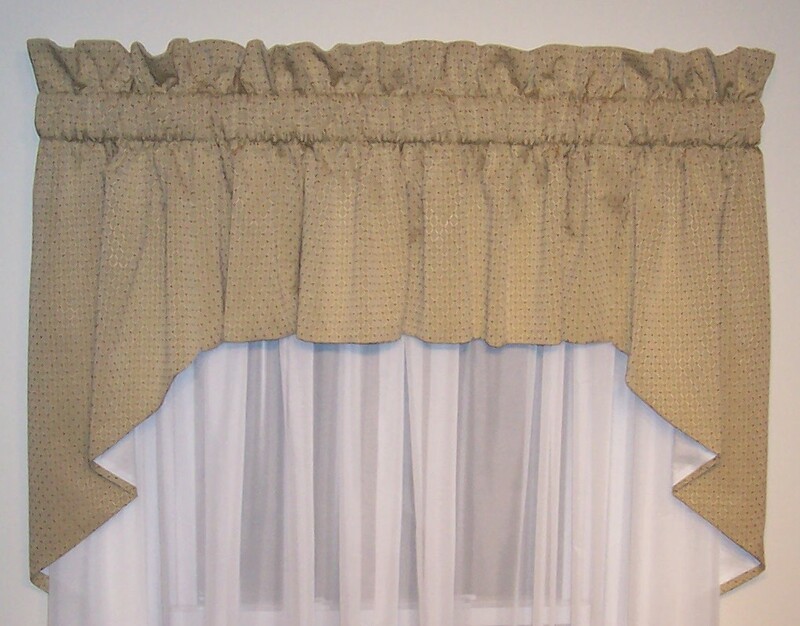 The M Shaped Valance is "M" shaped along bottom edge, has a 3 inch rod pocket, and is fully lined with cream cotton broadcloth. Measures 72"W x 18"L and fits a single window. Use multiple valances for wider windows. Hang on a 2 1/2 inch continental rod. Color featured in photo is Currant. Fabric content: Face 50% Polyester, 50% Cotton Lining 100% Cotton. Made in America, Galaxy is a luxuriously soft textured poly/cotton blend with a polished finished. Meticulously crafted and fully lined with high quality cream broadcloth. The 100W x 39L Swag fits a standard single window. 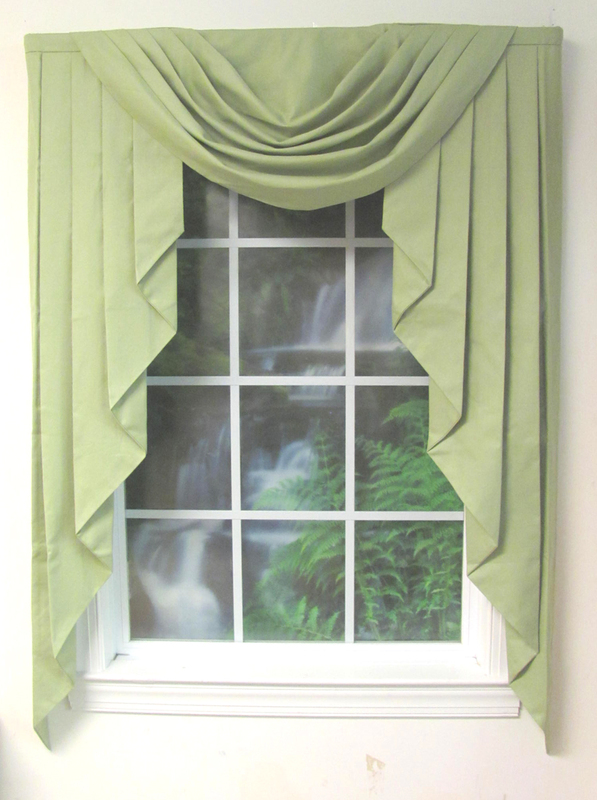 Use the Lined Insert Valance between the two pieces to accommodate wider windows. Very limited quantities and styles are available in limited colors. 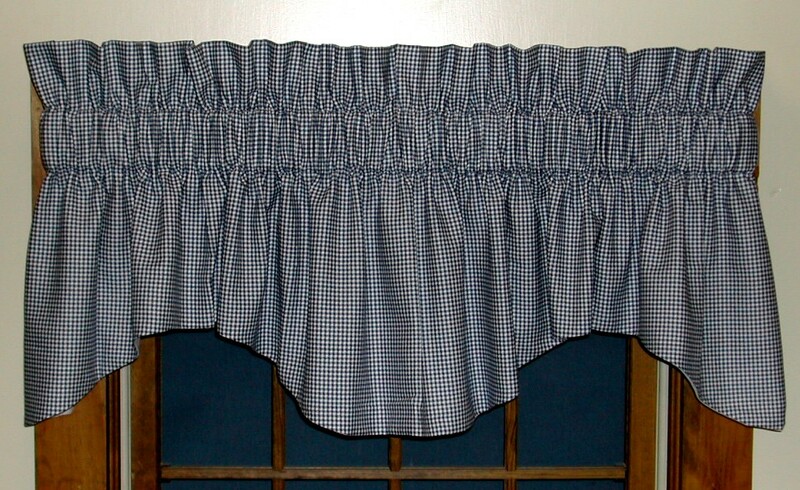 The Blouson Valance measures 80" X 16" with a 2" header and a 3" rod pocket. Fits a 2 1/2" continental rod. This American-made Colburn Blouson Valance features open sides so that it can be stuffed with tissue paper for a pouf look or left as is for a tailored appearance. Measuring 80 inches wide by 16 inches long, the valance includes a two-inch header and a three-inch rod pocket. Use with a 2 ½-inch continental rod. Four lovely color options are available: canyon, charcoal, geranium and mineral. The Federal Valance features 4 rows of sewn in folds creating a scalloped effect along its along bottom edge. Layers of folds fall into place when shirred on a 2 1/2" Continental rod. Has a 3 inch rod pocket, and is fully lined with cream cotton broadcloth. Measures 72"W x 15"L and fits a single window. Use multiple valances for wider windows. Easy to hang. Cascade and Jabot Pair are lined with a high quality polished off white lining, have a 1 1/2" rod pocket, no cording, and no header. Cascades over Jabots are a formal window treatment that looks great in a dining room, living room, or bedroom. Use a 1 inch double curtain rod for hanging. Place the Jabot Pair on the outside rod and cascade on inner rod. Flip cascade over the rod and center over the Jabots. Soft folds add elegance to this formal window treatment and can be used in any room in your home. Fully lined, 1 1/2" rod pocket. Use a 1" standard double rod for hanging Cascade over Jabots. Fits a single window. Use additional cascades to accommodate wider windows. Dimensions: 17" x 17". Self Corded. Sage, Blue. 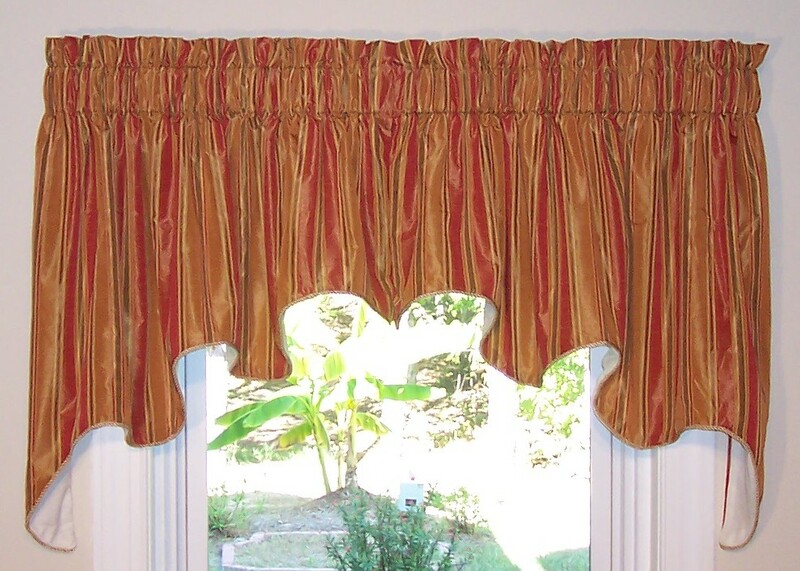 Made in America, the Lined Swag Insert Valance measures 50"W X 14"L. Fully lined, 2" header and 3" rod pocket to accommodate a 2 1/2" continental rod. Allow a 2 to 1 ratio of fullness. Two 50 inch wide valances fit a standard single window. 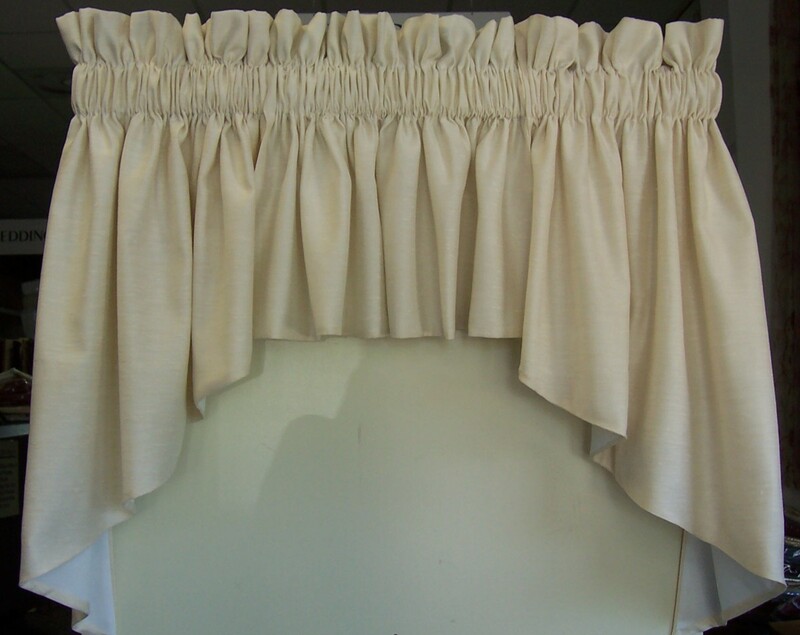 The Tie-Up Valance is lined with high count ivory broadcloth, and measures 52" wide by 30" deep. It has a 3" rod pocket, no header, and two pre-made strap ties sewn in for easy hanging. 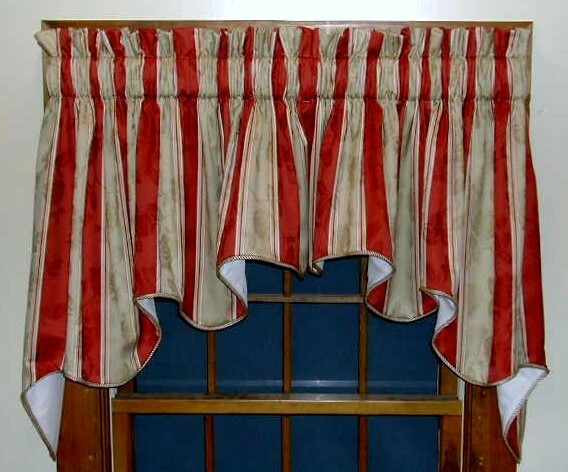 Photo illustrates Rosewood Tie Up Valance. Colors: Natural Linen Woodrose, Green, and Burgandy. The Bramosole Crescent Swag is a casual shirred fruity design and can be used to complete most any ensemble. Its simple lines are very tasteful. The Crescent Swag is packaged as a three piece window set. Total measurement is 150" wide and 39" long for sides, 14" long for center piece. 3" rod pocket, 1-1/2" header, fully lined. Use a 2 1/2" continental rod for hanging. Fits a window up to 48" wide. Both layers are fully lined on this gorgeous double scalloped valance in a Gypsy Black Swan pattern. The floral fabric design uses rust, gold and taupe on a black background. The top layer is the floral design, and the bottom layer is solid rust backed by an ivory lining. Each layer has a scalloped border with satiny twisted rope cording. 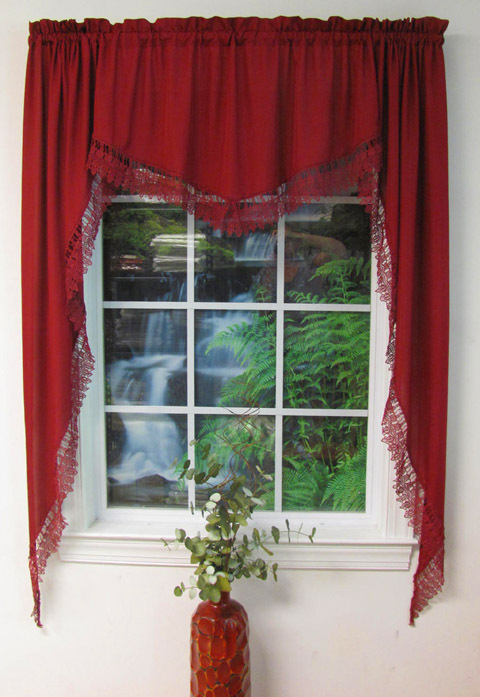 This beautiful window topper with a 3-inch pocket is available in a 100-inch width from The Curtain Shop. The length is 15 inches at the center and 23 inches at the side. 3" rod pocket, 1 1/2" header, both layers are fully lined. Made in the USA, dry clean. Georgette window toppers are a soft and supple faux suede fabric design adorned with an allover embroidery in a color pallet of soft coordinating tones. Bottom edge is trimmed with matching twisted rope cording. Other features include 3" rod pocket, 2" header, and fully lined. Colors: Camel (feature in photograph), Gold, and Brick. Machine wash gentle cycle in cold water. Tumble dry on low heat. Do Not Bleach. Made in the USA by Curtains & Home Decor. Derby Surrey is tan with burgundy highlights. Sewn in tucks makes installation simple. 3" rod pocket, 3" header, fully lined in off white lining material. Use 1 1/2" continental rod for hanging. Made in the USA by Charles Curtain Company. Made in the USA. Dorthea Stripe is a bold stripe in black, burgandy, green, and gold set on a 100% cotton woven jacquard base cloth. This fabric is versatile; it can be used in any room to promote a casual and relaxing atmosphere but also does well in a formal setting. An excellent choice for a formal dining room, entertainment center, or a quite and cozy den, study, or bedroom. 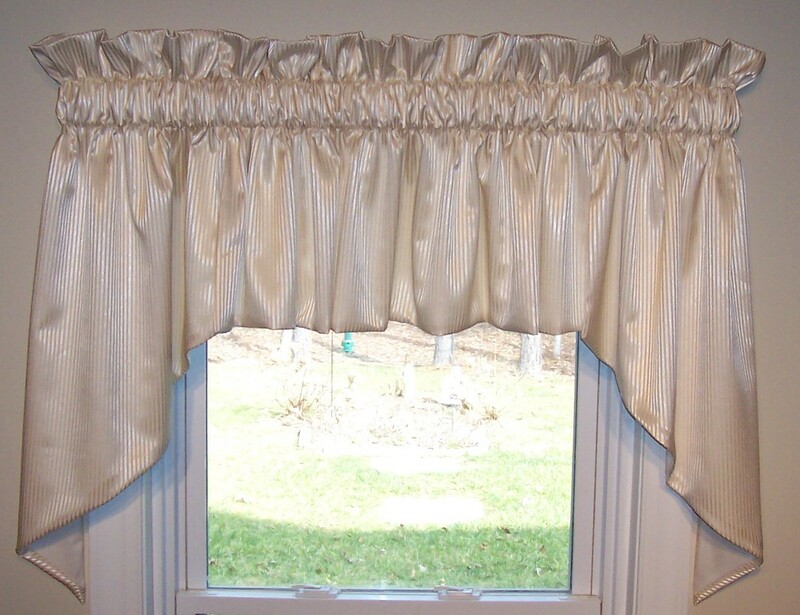 Valances and Swags Dimensions:75"W x 14"/18"L Fully lined in off white lining. 3" Header 3" Rod pocket - use a 2.5" Continental rod for hanging. Francesca is a lovely traditional floral pattern on a white ground and is the perfect choice for providing a soft touch of femininity to your home. 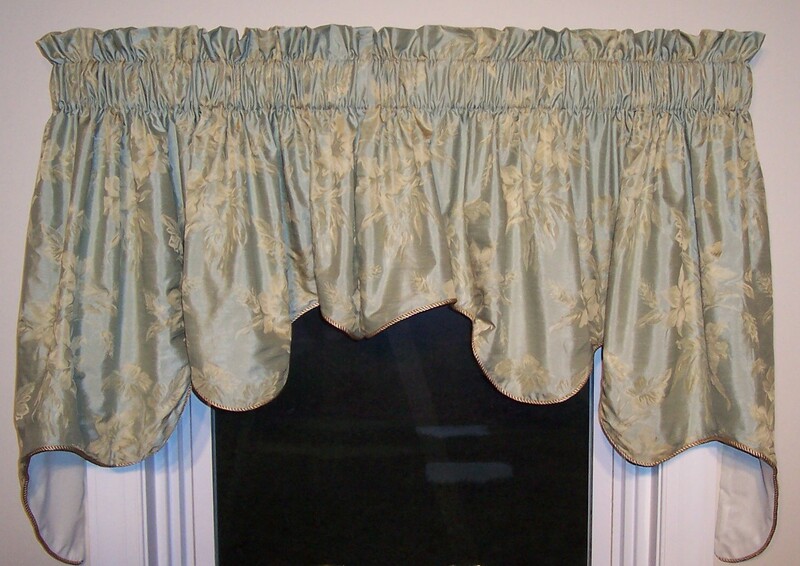 The Bradford Valance is a lined two layered and double scalloped valance. The top layer is a Blue on White floral and is accented by a coordinating Blue solid and bias binding bottom layer. Glory Valance in Blossom Red features a striking embroidered floral and leaf design of red and green on an Ivory linen-like loose weave ground. Bottom edging of embroidered layer is adorned in coordinating tassel fringe. Bottom layer is a lustrous woven fabric featuring woven diagonal stripes forming a "V" pattern in the of perfectly coordinating colors. Top layer is not lined, bottom layer is lined. 3" rod pocket, no header. Made in the USA. Dimensions: 51"W x 16"L x 15"L (measured from top of rod pocket). Floral fabric design of Magnolias with greenery set on a Salmon ground. 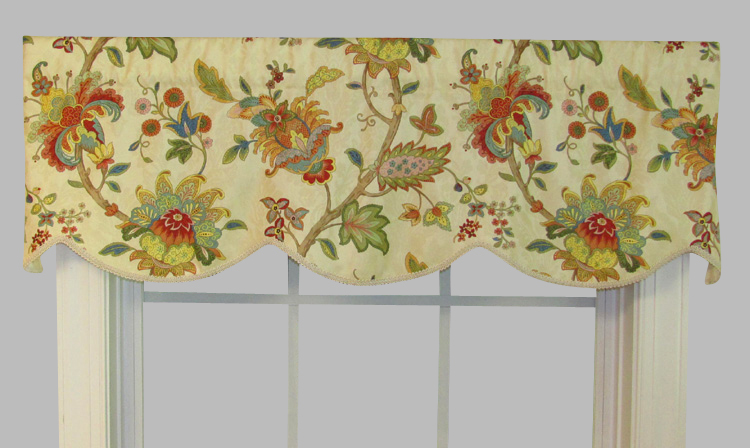 The Regal Valance is 50" wide and 20" long. 3" rod pocket, no header. Fully lined. ORDERING MORE THAN TWO WILL RESULT IN ORDER CANCELLATION. Fontana is a dramatic fabric design featuring fashionable floral/leaf print of blue, green, gold, and mauve on a rich red ground. Dimensions: 52"W x 15"L measured from top stitch of rod pocket to bottom edge. 3" rod pocket, 2" header, and fully lined. Use two for standard window. Gold metallic overlay accentuates this exquisite jacobean stripe of russet, green and gold. An occasional fine black stripe adds definition to this handsome fabric design. Made of 100% Combed Cotton. Dry cleaning recommended. 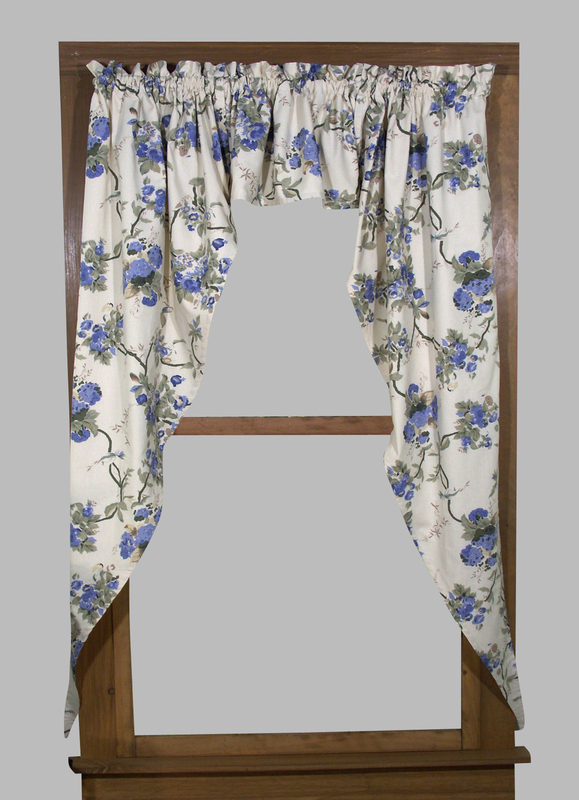 Insert valance can be used with the Jabot Set to expand for larger windows, or stands alone on its own. Pole Top Drapery - Dune by Croscill Dimensions: 82x84 Bedding ensembles by Croscill are beautiful and a great value. Dune Bedding by Croscill. Sultry chenille is swirled with a champagne metallic crushed satin that emulates waves of the ocean and sand on a beach. Contemporary and formal this stylish ensemble can easily suit anyone’s taste. High sheen satin complements gusseted decorative pillows for a more tailored look. Adding to the chic tone, Dunes 300TC sheets have a sand quality with a complementing multi colored wave attached boarder. Dune’s satin ruffle bed skirt adds softness to maintain a sense of balance. Dimensions: 52"W x 15"L measured from top stitch of rod pocket to bottom edge. 3" rod pocket, 2" header, and fully lined lined. 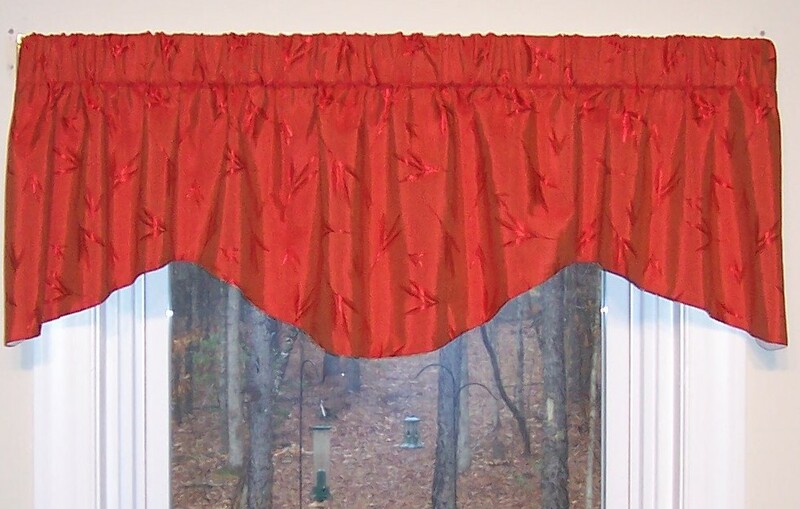 Valance measures 78" wide by 18" long Quantity - Two Fabric content: 59% Rayon/37% Polyester Lining 50/50 Poly/Cotton Fully lined. A beautiful peach /rose traditional floral on a cream jacquard ground. 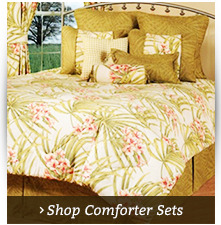 A sage green basket weave pattern is featured as the bed skirt and European pillow shams. Other coordinates include a pink/coral tissue-pick plaid, peach chenille solid, and a micro chenille stripe. This lovely Lined Swag is a two piece window topper. Fabric face has a soft textured finish. The Swag has a 3" rod pocket and 3" header, and is fully lined with off white cotton broadcloth. Meticulously construction with weighted corners. Dimensions: 100"W x 39"L, fits a single window. Hang on a 2 1/2 inch continental rod. Claiborne is a lovely textured poly/cotton blend fabric. 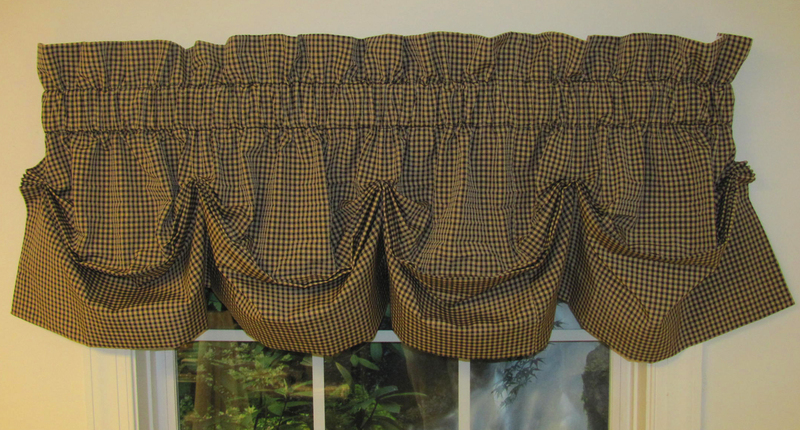 The Blouson Valance features a 3" rod pocket, 3" header and is self lined. You can stuff it with tissue paper for a pouf look or it can be used as a straight valance as illustrated in the photo. Rhapsody Festoon Valance by Croscill Home feature a lavish fabric design of stemming flowers in lavender, pink, green, and brown on a medium weight course weave beige ground. It looks great in any room in your home. Features: 3" rod pocket, 3" header, not lined. 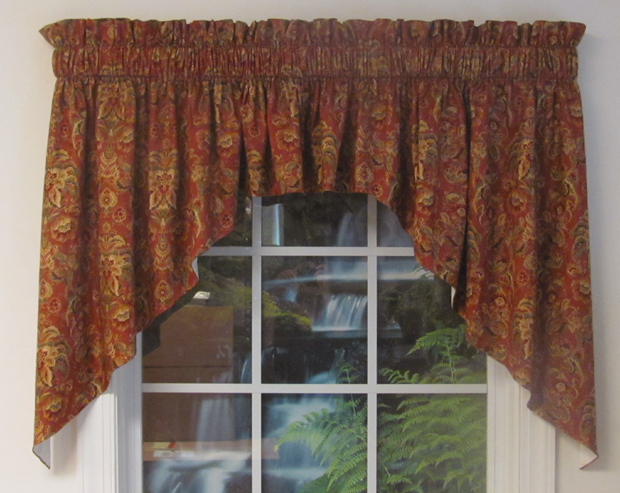 For proper fullness valance should measure two to three times the width of your window. Fabric Content: 100% Cotton, dry clean only. Finished in the USA, fabric from Pakistan. 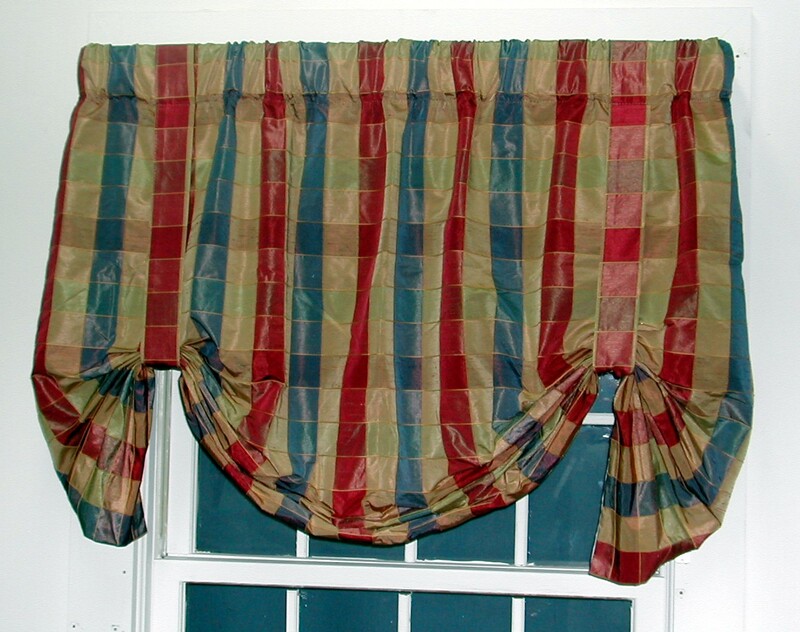 Brighten up any space with the Plymouth Plaid valance. 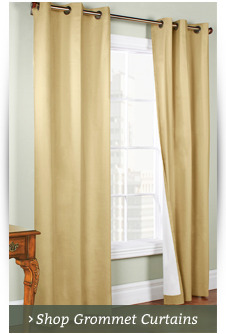 The tie-up design of these curtains includes matching, sewn-in straps with buttons as well as a 3-inch rod pocket. 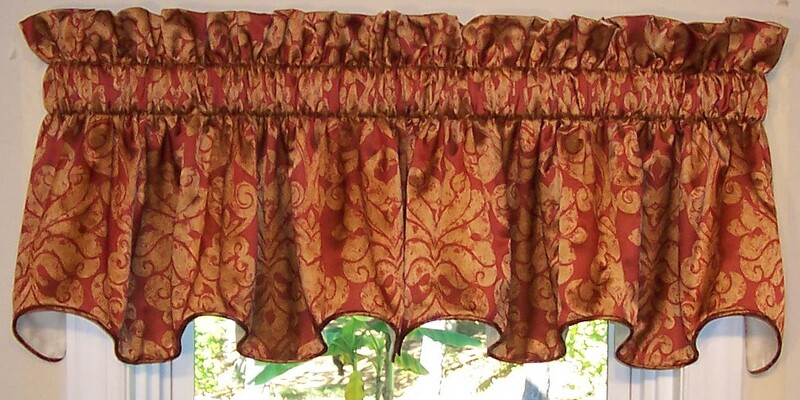 This valance, which is imported from India by Ricardo Trading, is made of 100 percent cotton and can be machine washed cold on gentle, tumble dried on low and warm ironed for touch ups. It measures 52 inches wide by 21 inches long and comes in red tones. Click on color bar below to enlarge. Machine wash gentle cycle in cold water. Tumble dry on low heat. Warm iron Touch up. This cornice valance in a vintage linen shade will add a beautiful new focal point to any room. The premium fabric is from our Almost Custom Faith Edward line at The Curtain Shop. The scalloped edge is accented with coordinating cording. 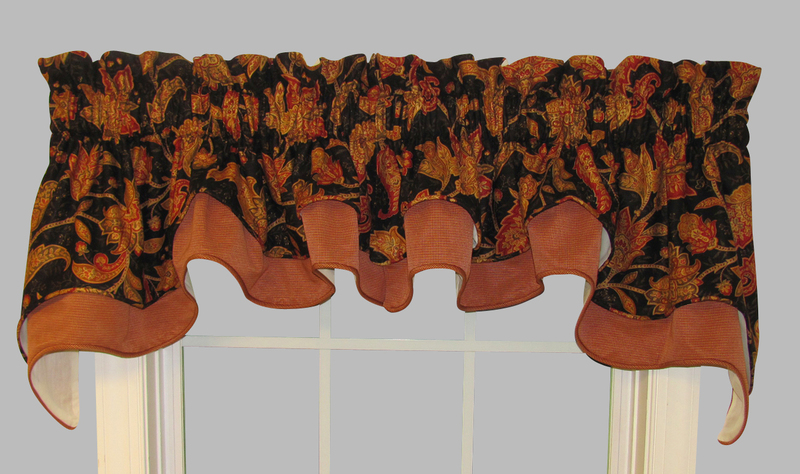 This unlined cornice window valance is 52 inches wide and 15 inches wide. 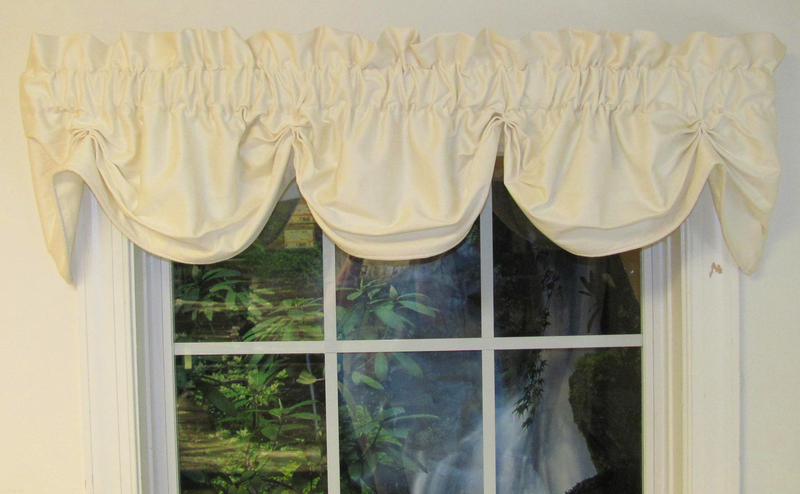 Use a continental rod with a 2 1/2-inch diameter for this lovely cornice valance with a 3-inch rod pocket. 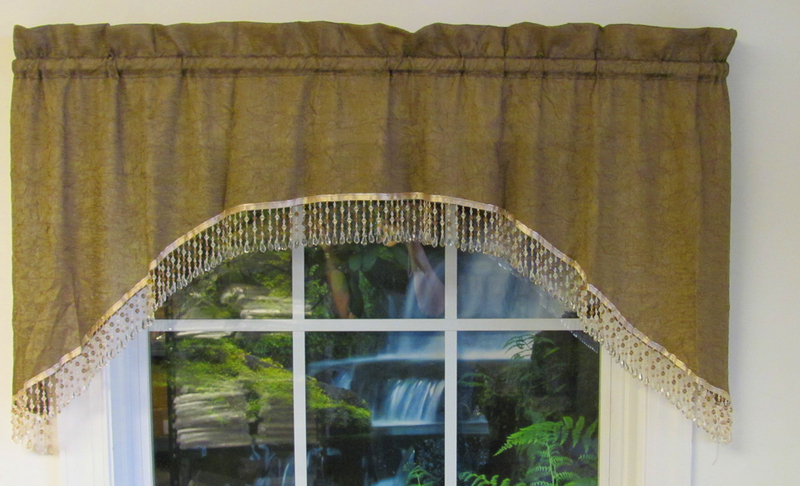 Our Cornice Valance is a lovely way to bring fashionable beauty to any window in your home. It's sleek tailored lines give that custom look at a ready-made price. The Cornice valance remains one of the most economical window treatments available while retaining the highest quality our work room is known for. Dimensions: 50"W x 15"L Not lined. Fits 36" to 46" wide window. 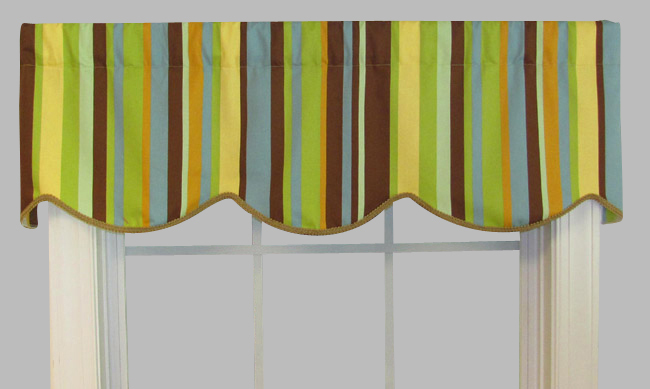 This cornice valance in a bold stripes pattern looks like a custom tailored window treatment. The beautiful fabric by Faith Edward is from our Almost Custom line of affordable cornice valances at The Curtain Shop. The length is 15 inches, and the width is 50 inches. The scalloped border is trimmed with gimp cording. 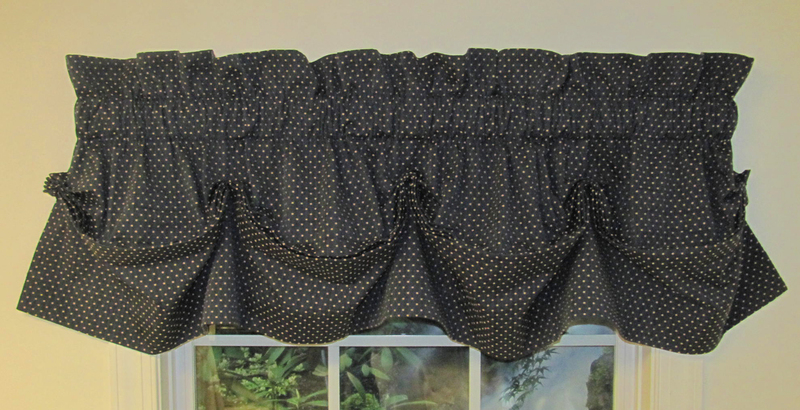 This unlined valance will fit windows 36 inches to 46 inches wide. A 2 1/2-inch continental rod is recommended for the 3-in. rod pocket. 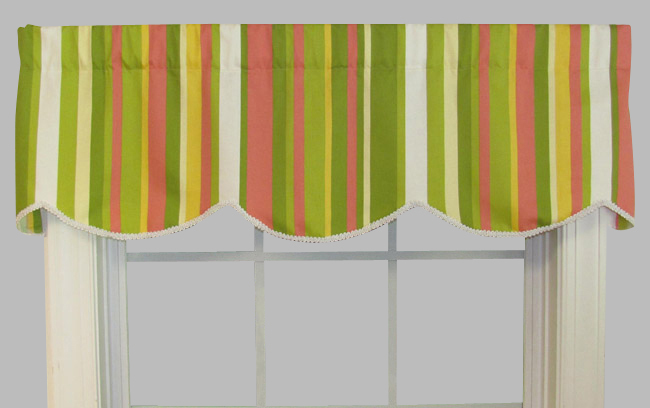 The Dahlia pattern of bold stripes in spring colors on this cornice valance from The Curtain Shop will add a fresh new look to any room. Tailored lines and a scalloped border with off-white trim create a custom-made look for this unlined window topper. The fabric is from our Almost Custom Faith Edward line. Designed to fit windows that are 36 to 46 inches wide, the dimensions are 36"W x 15"L. The 3-inch rod pocket will easily accommodate a continental 2 1/2-inch diameter continental rod for hanging. 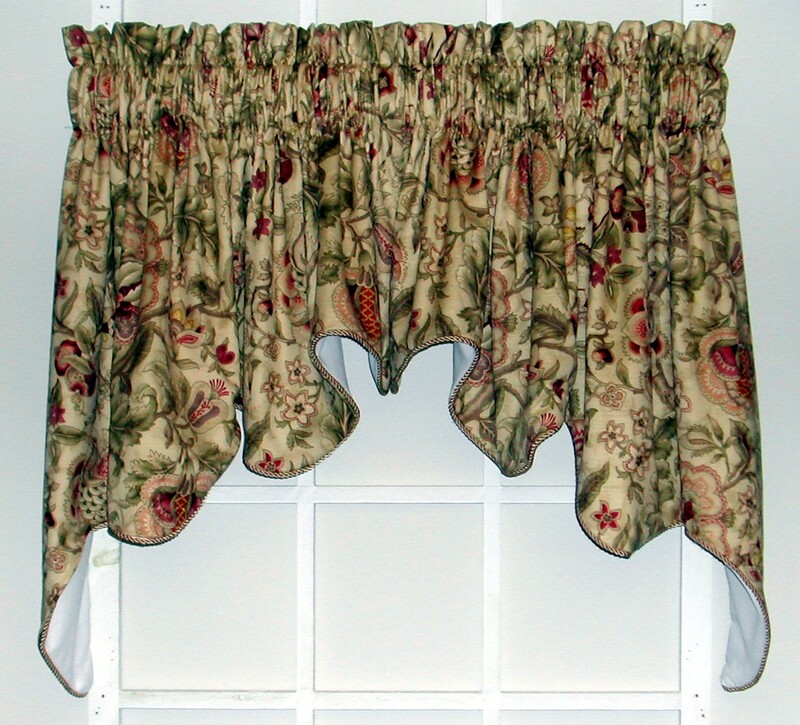 An elegant floral pattern with ivory, buttercream and green against a cabernet red background will add a rich new look to your rooms with this Bramasole Cabernet cornice valance from The Curtain Shop. The fabric by Faith Edward is from our Almost Custom collection of exquisitely designed cornice valances with scalloped bottom borders trimmed with premium cording in coordinating colors. This unlined cornice with a 3-in. rod pocket is 52 inches wide and 15 inches long to fit windows ranging in width from 36 to 46 inches. Wider sizes are available upon request. Made in the USA. The unlined Colburn Cornice valance features a sleek, tailored look and two color options: canyon and charcoal. Measuring 52 by 15 inches, the valance includes a three-inch rod pocket for use with a 2 ½-inch continental rod. 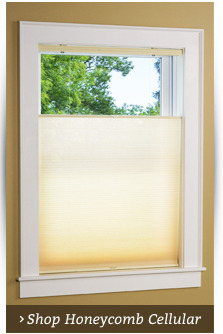 It's made of a cotton/poly blend and fits windows measuring 36 to 46 inches wide. The beautiful fabric from the Almost Custom by Faith Edward collection features a scalloped bottom edge with coordinating gimp cording. Made in the U.S.
Wider sizes are available; special orders cannot be returned. 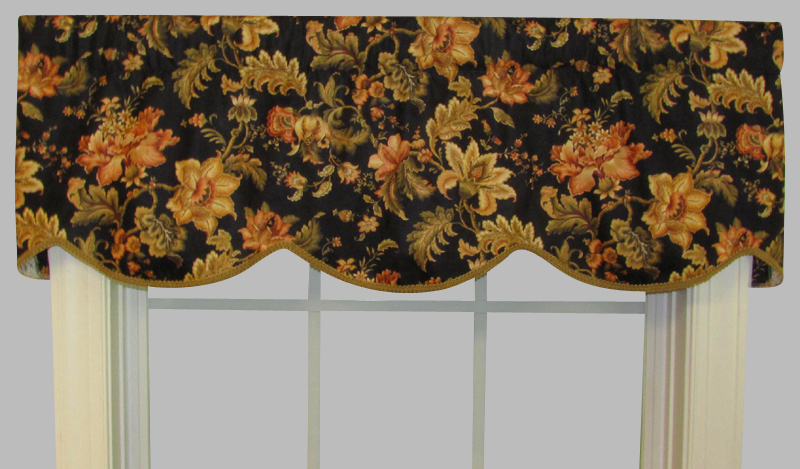 An elegant Dorthea Ebony floral print fabric cornice valance will create a classic new focal point in any room. This beautiful ready-made window topper from The Curtain Shop has a scalloped bottom edge trimmed with gold cording to complement the design of pale pink, ivory and cream flowers against a black background. 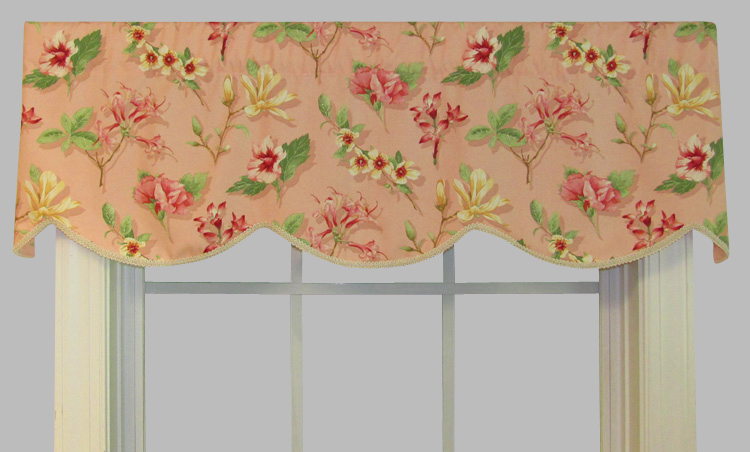 These unlined cornice valances are each 52 inches wide and 15 inches long. They will fit window widths ranging from 36 to 46 inches. The custom look of this Gypsy Dance Black Swan cornice valance is reflected in the exceptional tailoring and beautiful fabrics from our window treatment collections at The Curtain Shop. A floral design with shades of red and gold against a deep black background creates the elegant look of this window topper with a scalloped border trimmed in gold cording. The 52-inch width will fit windows up to 46 inches wide. The length is 15 inches. The 3-inch curtain rod pocket will easily fit a 2 1/2-inch rod. 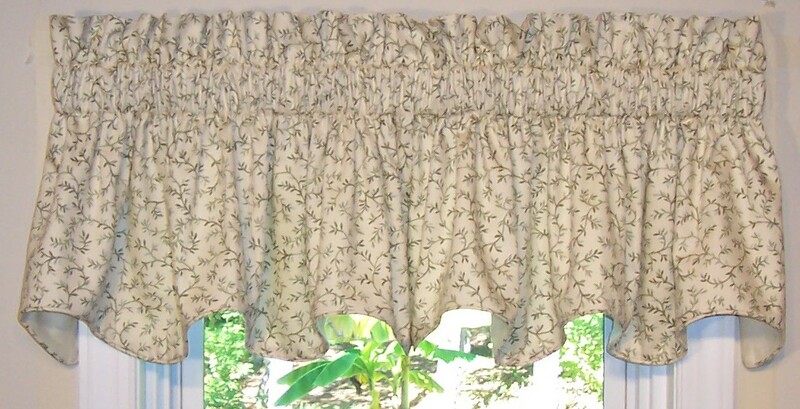 This Emberton Jasmine cornice valance has an elegant floral design fabric by Faith Edwards that is part of our affordable Almost Custom collection of American-made cornice valances. 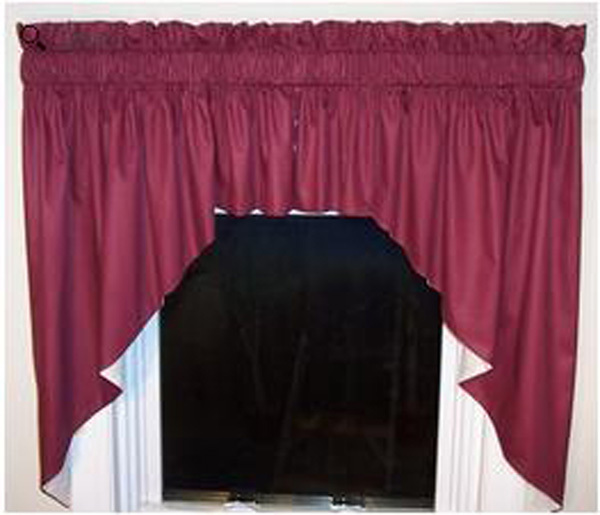 The dimensions of the unlined valance is 52 inches wide by 15 inches long to fit window widths up to 46 inches. A continental rod with a 2 1/2-inch diameter is recommended for use with this rod pocket cornice valance window treatment. Made in the USA. 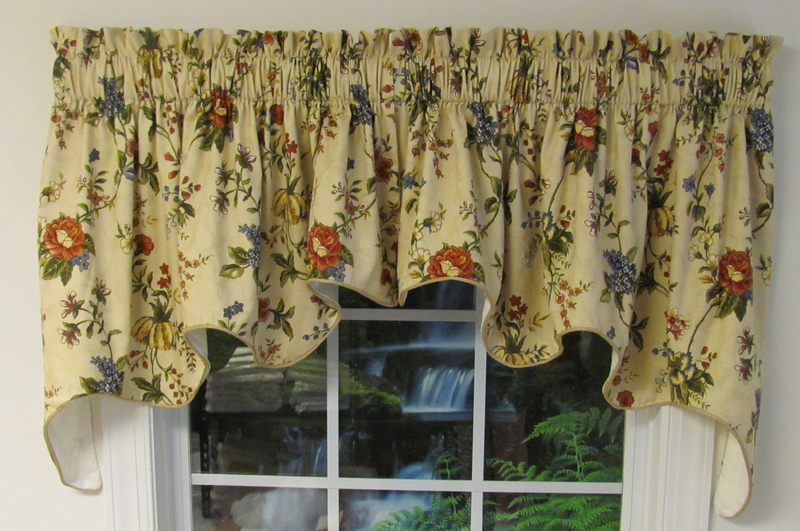 Our Cornice Valance is a lovely way to bring fashionable beauty to any window in your home. It's sleek tailored lines give that custom look at a ready-made price. The Cornice valance remains one of the most economical window treatments available while retaining the highest quality our work room is known for. 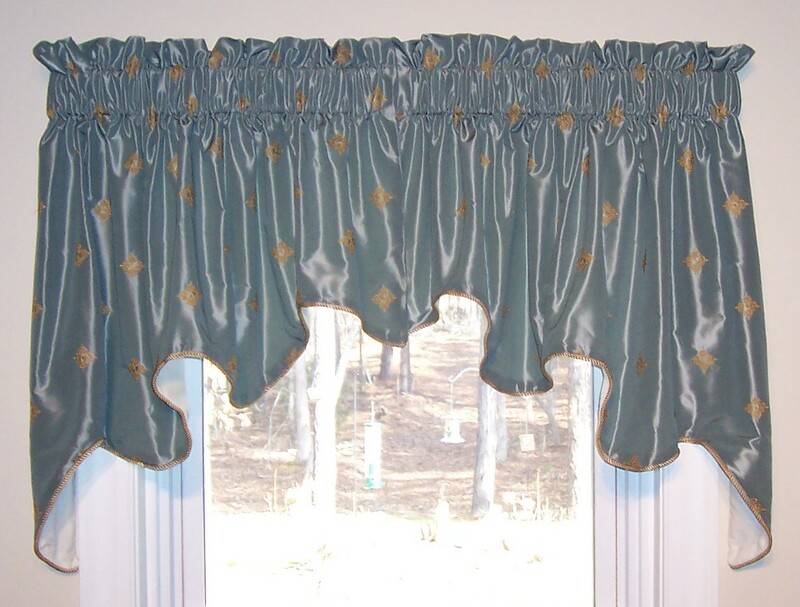 The Cornice Valance features a lovely scalloped bottom edge accented with coordinating gimp cording. Use a 2 1/2" Continental rod for hanging. 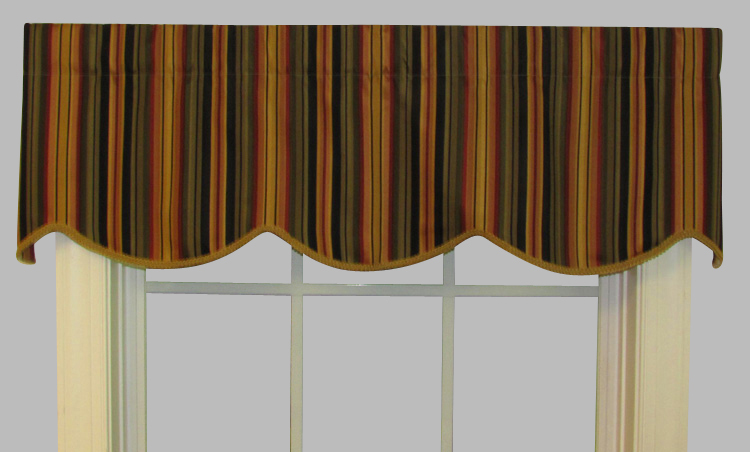 Rich shades of reds, orange, greens and gold against black create this striking Mateo striped cornice valance from The Curtain Shop. 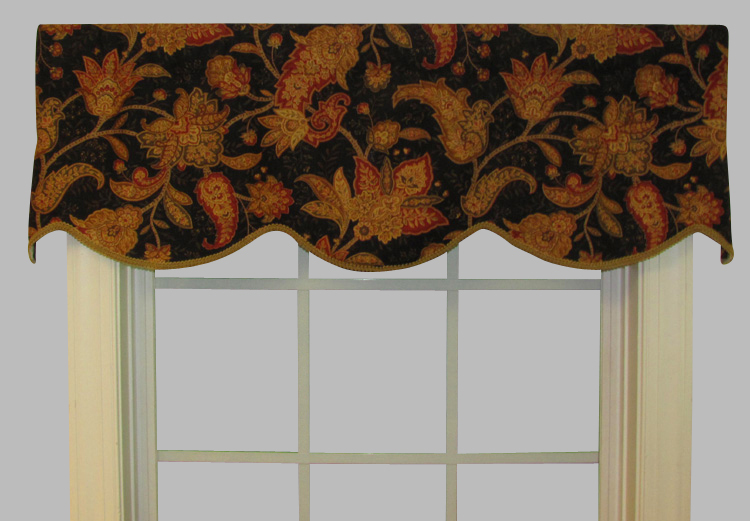 The 52-inch width of this rod pocket cornice valance will fit window sizes 36 inches to 46 inches in width. The length is 15 inches. We recommend that you use a 2 1/2-inch continental curtain rod for hanging. If you've got questions or require custom sizing, consult our experts. Our family-owned business has been helping homes look beautiful since 1953. 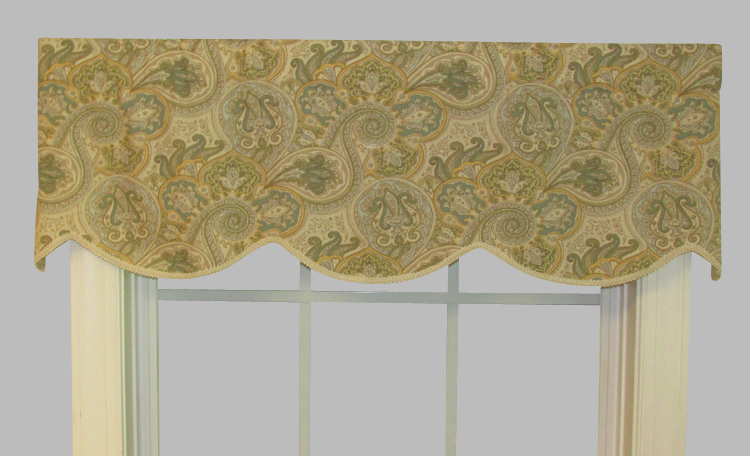 This scalloped Paddock Shawl cornice valance in a paisley pattern on a soft background of mineral is available in standard and special-order sizes from The Curtain Shop. The standard 52-inch width cornice valance will fit a window that is 36 to 46 inches wide. The length is 15 inches. The scalloped border is edged with coordinating cord trim. 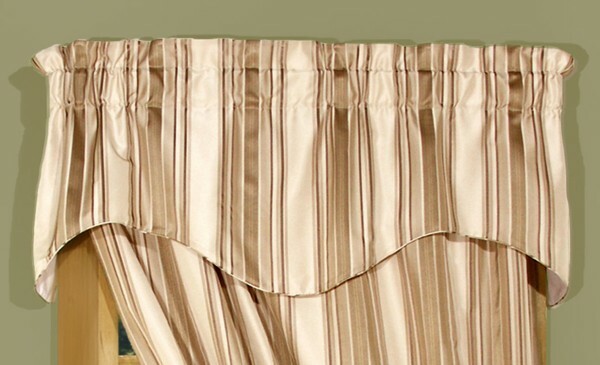 The 3-inch curtain pocket requires a 2 1/2-inch continental rod. Made in the USA. 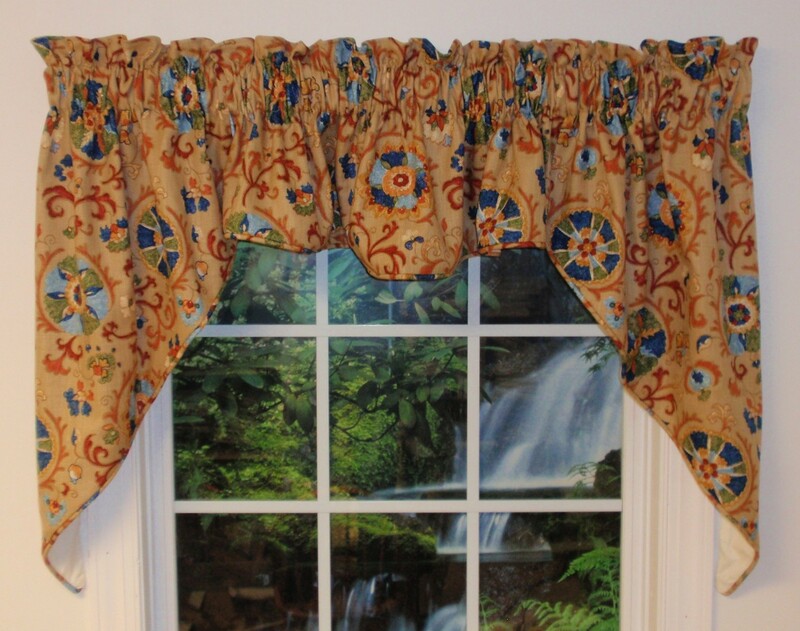 Our Cornice Valance is a lovely way to bring fashionable beauty to any window in your home. It's sleek tailored lines give that custom look at a ready-made price. The Cornice valance remains one of the most economical window treatments available while retaining the highest quality our work room is known for. 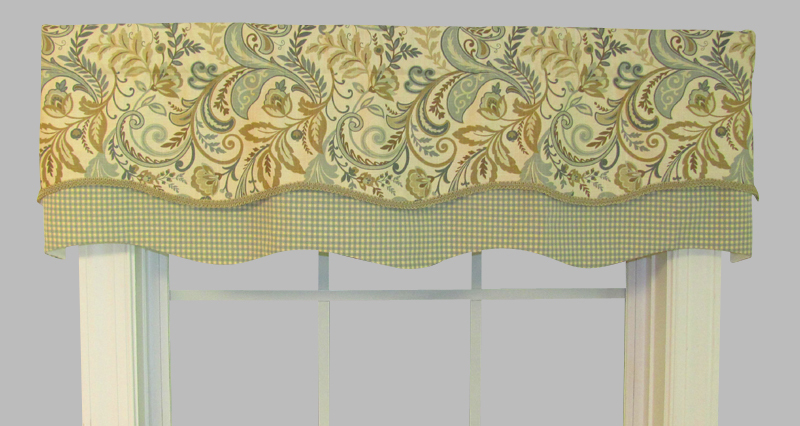 The Cornice Valance features a lovely scalloped bottom edge accented with coordinating gimp cording, and is offered in a variety of fabric designs and colors. Enjoy the custom look of Rutherford Hill Merlot cornice valances created with fabrics by Faith Edward from our Almost Custom program at The Curtain Shop. 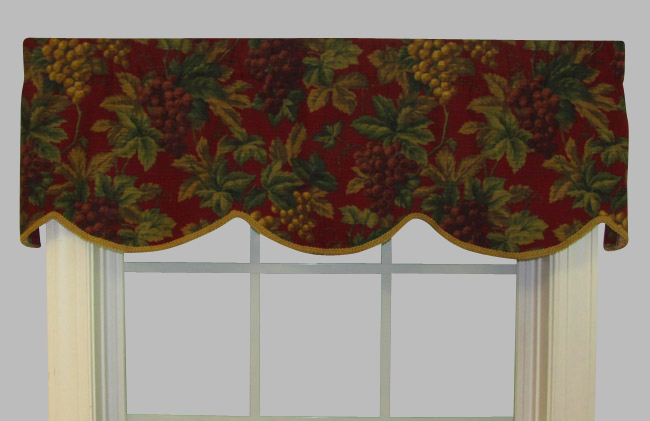 A lovely green leaf and grape design is on a rich Merlot red background on these cornice valances with a scalloped bottom border accented with coordinating gimp cording. This unlined American-made window topper has a 3-inch rod pocket to accommodate a 2 1/2-inch diameter continental curtain rod. 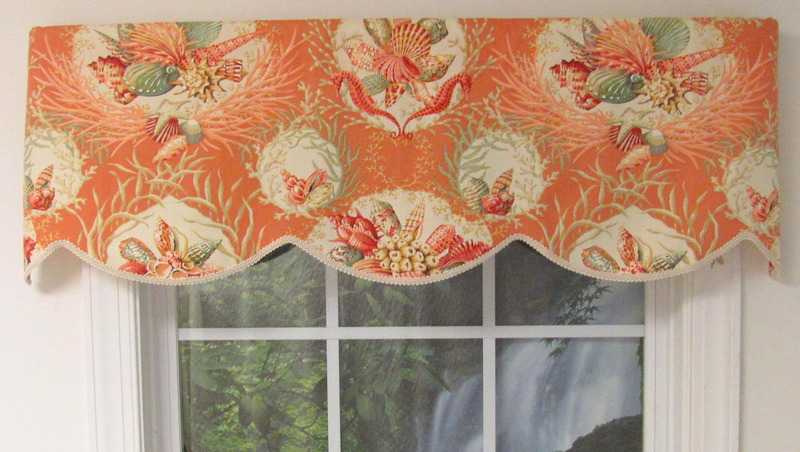 Our Seaworthy cornice valance with a vintage tropical seashell pattern is available in aqua or coral from The Curtain Shop. These U.S.-made seashell window valances are each 50 inches wide and 15 inches long. 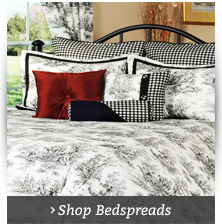 The scalloped bottom edge has a corded trim accent. 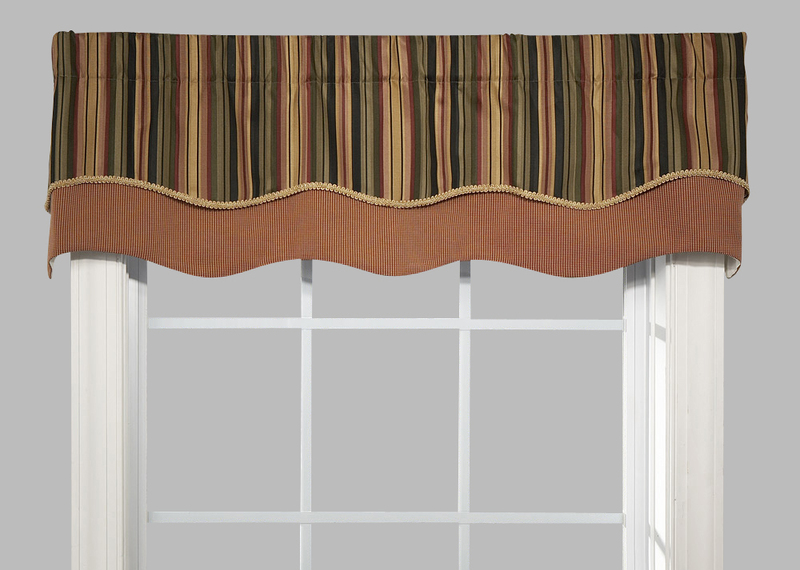 This unlined valance is designed to fit a standard window width ranging from 36 to 46 inches. The 3-inch rod pocket on the Seaworthy beach print valance will accommodate a 2 1/2-inch diameter continental curtain rod. 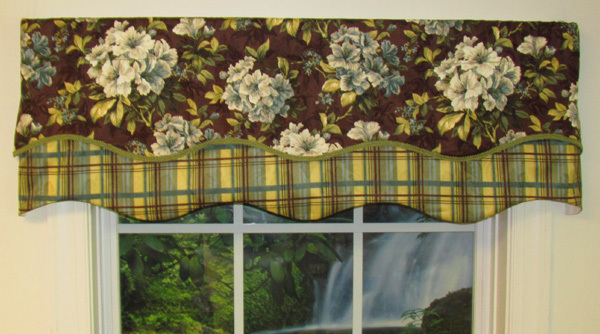 Wider sizes in this window valance design are available by special order. Just contact our in-house custom window treatment experts. We've been providing the world beautiful curtains since 1953. Made in the USA. 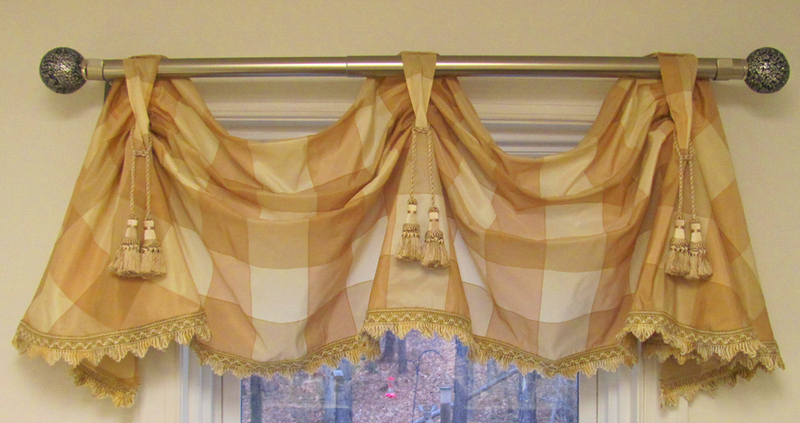 Our Cornice Valance is a lovely way to bring fashionable beauty to any window in your home. It's sleek tailored lines give that custom look at a ready-made price. The Cornice valance remains one of the most economical window treatments available while retaining the highest quality our work room is known for. 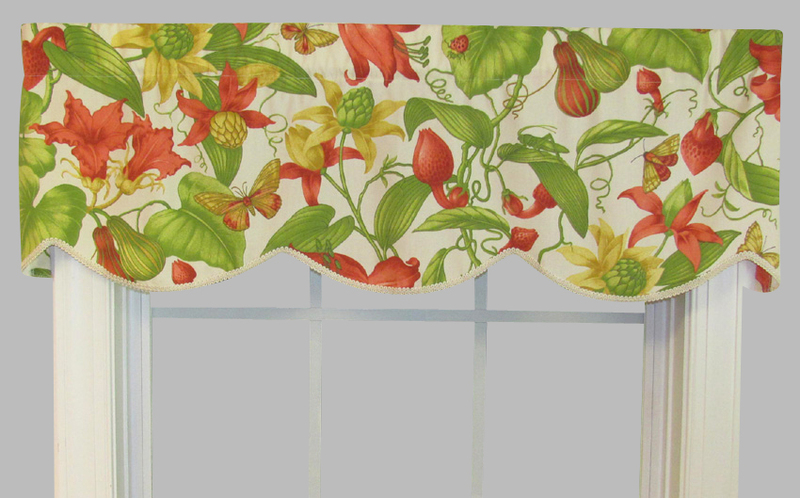 The Cornice Valance features a lovely scalloped bottom edge accented with coordinating gimp cording, and is offered in a variety of fabric designs and colors. Tonga Robin's Egg is a heavy weight fabric resembling Mattlasse. The 2 piece Swag fits a small window approximately 25" to 30" wide (photo was taken on a 41" wide window). Insert Valance may be purchased separately to accommodate wider windows. Scalloped bottom edge is self corded. Fully lined. Machine wash cold water, tumble dry low heat, warm iron as needed. Made by Curtains and Home Decor. Made of 100% Cotton. Fiber filled. We offer window toppers and valances that complete the look of your window fashion. The Curtain Shop offers a wide assortment of window toppers in printed patterns and solid colors. We also have matching curtains to complete your window transformation. Valances, swags and window scarves offer a quick an easy way to update your décor. They can enhance the design of any room. Our window toppers come in a variety of the highest quality fabrics that offer durability. Many feature gathers that are sewn in place or a belt-loop tab for easy hanging. All you have to do is place it on a rod. Many feature standard sizes, or you can order additional valances to accommodate a larger window. We also offer the convenience of online shopping at thecurtainshop.com. You can order with confidence. Visit the website for product information and shipping details. You also can speak to a customer service representative by calling our toll-free number at 1-866-886-3632.